My earliest memories of food involving shrimp goes back to my childhood in the city of Bandar Mah-Shahr, meaning the "port-city of the moon," located in the southwestern region of Khuzestan. I don't remember much about how the town looked like and what life was like outside of our home. However, I remember some of the food my mother made using the local shrimp, such as the the shrimp and herb stew (ghalieh maygoo), a simple spicy sauteed shrimp dish which I make frequently. Then there were these tin containers in our kitchen filled with large, salted shrimps. Those shrimps wouldn't get to be cooked and served for we liked to eat them as a snacks; removing the heads, tails and the shells one by one before eating them, which was a messy but fun thing to do at the time! Seafood is an integral part of the Khuzestani cuisine. Although, Iranian cuisine in general is neither hot nor spicy, many Khuzestani meals are rather hot and heavily spiced. Naturally, this varies from town to town and household to household, depending on individual tastes. For instance, even though I grew up with spicy food I rarely ever cook or eat spicy or hot foods, and when a recipe calls for hot peppers I usually only use a little bit of red pepper flakes for that additional zest. Therefore, if you prefer, add some extra cayenne pepper during marination of the shrimp. 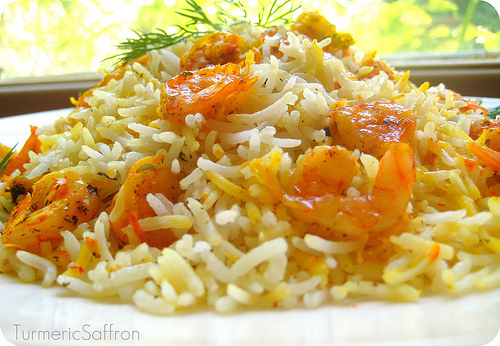 میگو پلو Maygoo Polow (spicy shrimp and rice) is made with spicy marinated shrimp and rice. I would like to point out that when using shrimp (fresh or frozen) to make sure that they don't smell, especially for this dish in which rice and shrimp will be cooking together, otherwise the smell will ruin the dish. Wash rice with cool water and soak in 8 cups of water and 4 tablespoons of salt for 2 hours. Drain. Rinse the shrimp with cool water, drain. 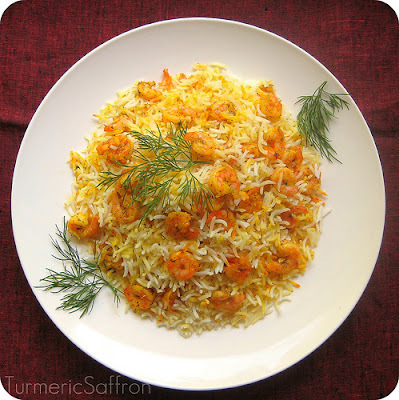 In a bowl, combine the shrimp with minced garlic, black pepper, red pepper, fenugreek, turmeric, ground limoo amani and salt, set aside for an hour. In a non-stick pot bring 3 quarts of water to a boil. Drain rice and gently pour into boiling water. Bring water back to a boil for about 7 minutes. Test to see if rice is ready, it should be firm in the center and soft on the outside. Strain and rinse with cool water. Wash the pot and return to heat. Add 4 tablespoons oil to the bottom of the pot and with a large spoon place rice in the pot, layering it with the marinated shrimp and building it into a pyramid shape. Make a few holes in the rice to let the steam out. Cook for about 7 minutes on medium-high heat. When rice starts steaming sprinkle 2 tablespoons oil, 2-3 tablespoons of water and the saffron over rice, cover, lower the heat and steam for about 45 minutes. Serve warm on a platter with yogurt and pickles. *Variation: Saute a large thinly sliced onion in 2 tablespoons of oil, add 1 teaspoon of minced garlic, turmeric, stir, add the shrimp, salt, black pepper, red pepper, ground lime and fenugreek, cook for a few minutes or until shrimp begin to change color. Then add it to the rice. Ever since I moved here I have seen artichokes in vegetable stores and supermarkets, but I never picked one up. It didn't look like any kind of vegetable that I grew up with and was used to. It was different, looked rough, prickly and unappealing. It also seemed a bit labor intensive and I had no time or patience to invest in finding a recipe and cooking artichoke. We simply met at the wrong time and the wrong place! The only time I got to taste it was at a friend's house and I was unimpressed. It didn't taste that great after all. So, I basically never tried artichokes ever since. However, that has changed recently since I now find myself utterly fascinated by all kind of vegetables from anywhere with any shape, taste, or color. 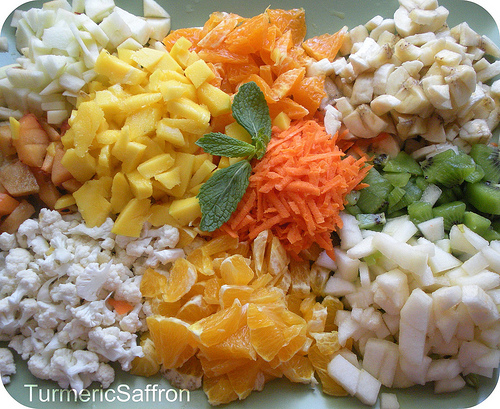 I like to learn about vegetables, cook them and do a little experiment to see if I can use them in a Persian dish! I cooked a few in an easy and simple way and I was pleasantly surprised. 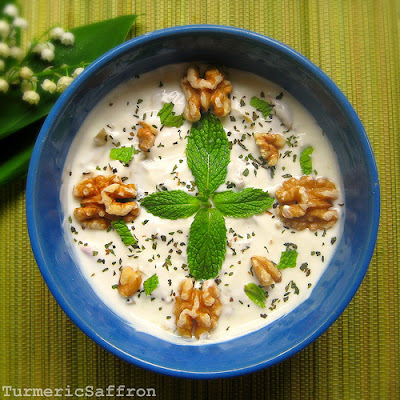 Here's my first attempt at making ماست و آرتیشو/ بورانی آرتیشو yogurt and artichoke the Persian way. 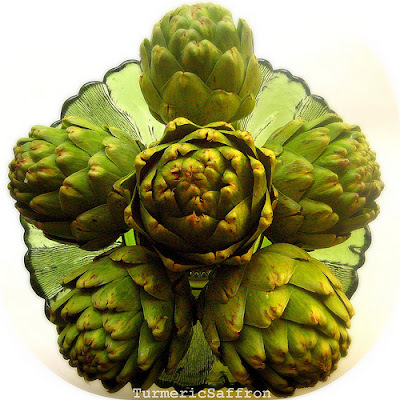 To prepare the artichokes, trim the bottom, cut off the tips, remove the hardest outer layers and cut them in half. To prevent the artichokes from discoloration squeeze some lemon juice over them right after trimming. 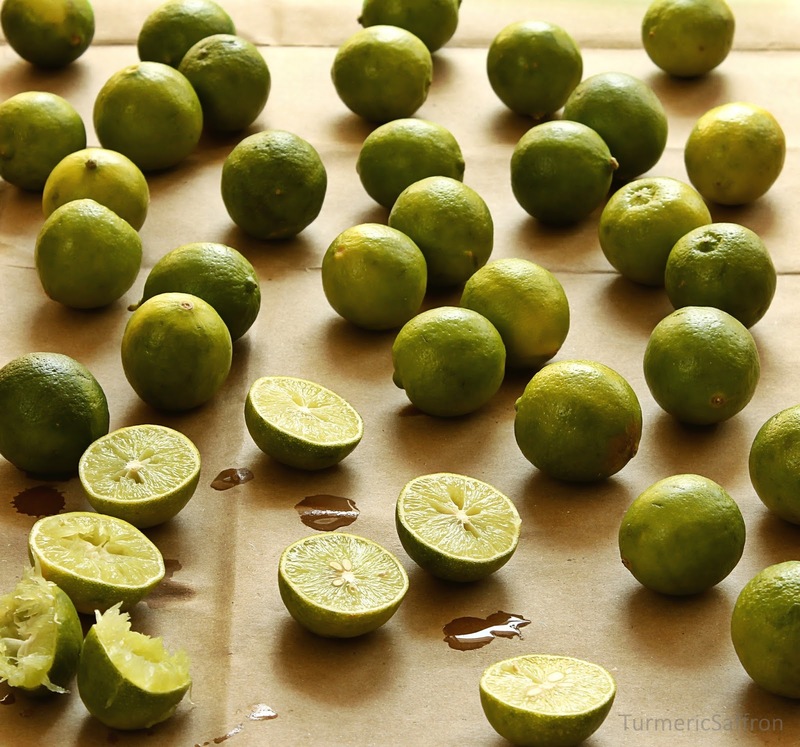 Steam them in a pan with a 1-2 cups of water over medium heat for 20-30 minutes. Once cooked, remove pan from heat and let cool. Then scoop out the artichoke hearts and chop them into small pieces. In a medium mixing bowl combine yogurt, artichoke hearts, mint and garlic. Add salt and pepper and mix well. Taste and adjust the seasoning. 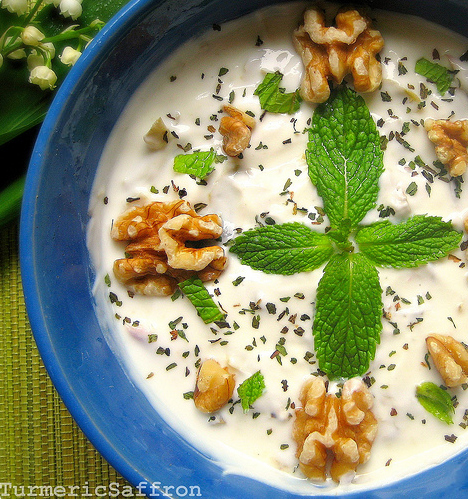 Garnish with mint leaves (fresh or dried) and chopped walnuts. Chill for a couple of hours and serve. 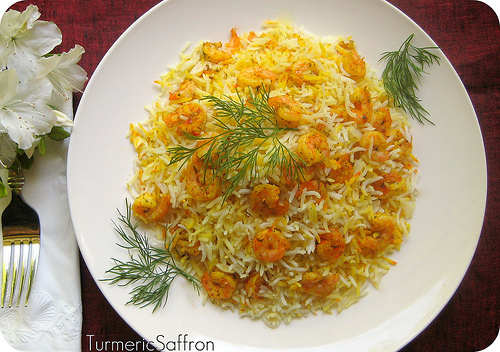 This is a great side dish for most Persian meals and goes well with any rice and khoresh dishes. Sharbat-e limoo is a refreshing sweet and sour drink that is just perfect for hot summer days. This tangy yet sweet sharbat is one of the popular drinks served to guests in Iran. Persian sharbats are drinks made with fresh-squeezed fruit juice and sugar. A sharbat should be well-balanced and not too sweet or too sour. However, in our home we like our شربت لیمو - sharbat-e limoo more on the tangy side. The combination of lemon/lime juice and water has many health benefits and this refreshing lemonade/limeade is a perfect summer drink. You can adjust the amount of sugar to your liking. Place sugar and water in a small pan over medium-high heat. Bring to a gentle boil until the sugar dissolves completely. Set aside to cool. Mix all ingredients, taste and adjust the level of sweetness to your liking, chill and serve. This fruit and vegetable pickle is one of her many recipes. A hand-written copy of it was recently found among her papers, books and photos, which is quite unusual for she had never wrote any recipes down due to her extraordinary memory. I like to think that she wrote it down for me perhaps, with the intention to pass it down and share it with others someday. Now, for this Mother's Day, I would like to write about one of her favorite recipes that she had titled as: "It's food as well as medicine," (ham ghazast va ham davast). 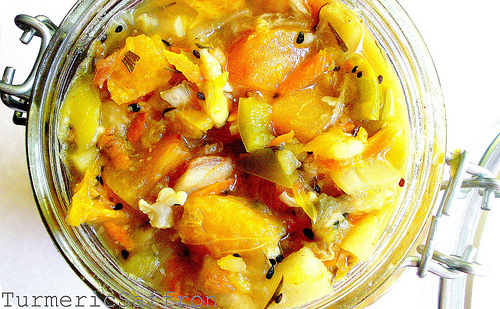 There are many fruits and vegetables that are great for making pickles. 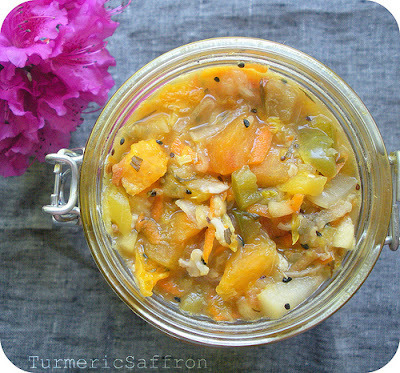 I've written about Vegetable Pickle before, however this is basically a fruit pickle with the addition of a few veggies. I tried to be true to the recipe and to not change anything. Maman's recipe, however, called for some fruits that are not in season right now such as, quince and persimmon, which I skipped and used kiwi and green bell pepper instead. 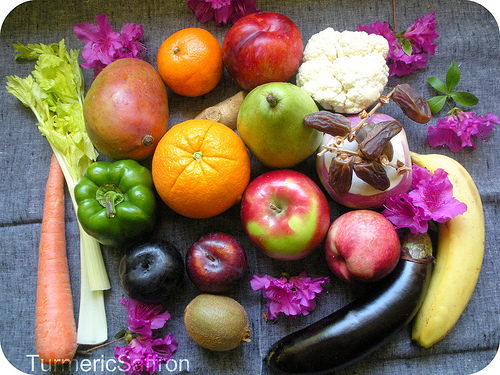 You can pick and choose among the abundance of delicious, gorgeous and nutritious fruits and vegetables. These days, discovering a good vegetable market is as exciting and as fun as going to a jewelery store or being on a treasure hunt! 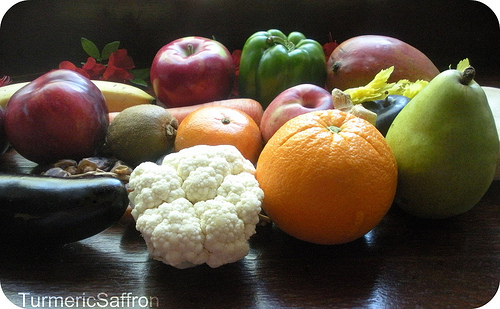 Wash, clean and dry all fruit and vegetables in advance and then cut them into tiny pieces. I reduced the amount to make it simpler, so if you like you can easily double the amount. Place all the finely chopped fruits, vegetables, dried herbs and spices in a large heavy-bottomed non-reactive to acid pan and place it on medium-low heat for 7-10 minutes. Turn the heat very low and simmer for 20-30 minutes until all ingredients are soft but not mushy. There's no need to add water, they'll cook in their own natural juices. Add walnuts,dates, tamarind, rock candy and vinegar. Mix well. Bring to a boil, reduce heat and simmer for another 10 minutes. Close lid and let cool to room temperature. Store in a cool and dry place or refrigerate. 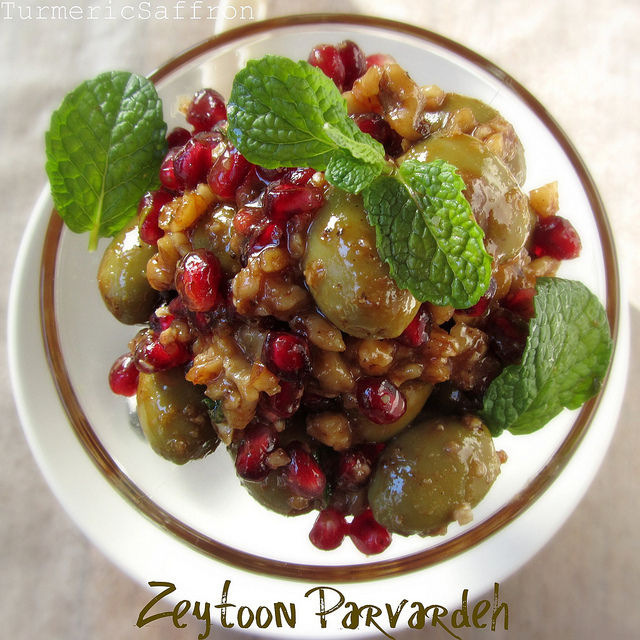 This torshi is ready in two weeks and could be served with most Persian dishes. I've never gotten used to the water bath canning method that is commonly used here. I still make pickles the old-fashioned way, the way that was done back home by my mother and my grandmothers without the water bath. But I do wash the cans thoroughly with soap and hot water before using them. 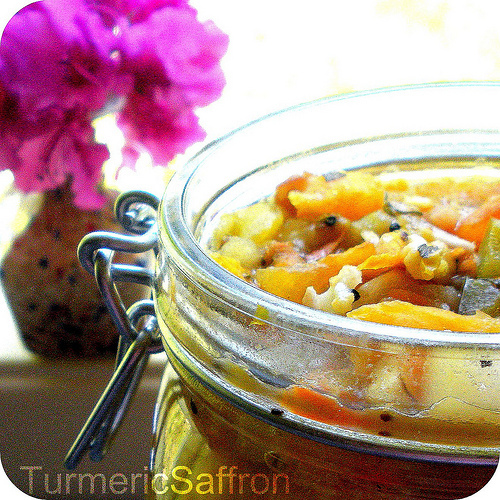 For canning and sterilization tips please see the following link.